Earlier in July I posted my take on Broken, Daniel Clay's deeply disturbing - and deeply moving - page turner of a debut novel. Now I've seen the movie based on that book. It blew me away. 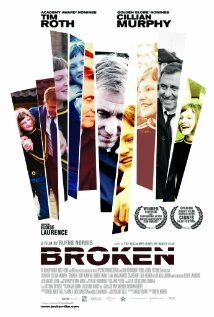 The story of an 11 year old girl who comes home from school one day to witness a brutal beating in her North London cul de sac, Broken won Britain's 'Best Independent Film Award' in 2012. The film was released here in the U.S. this past week. Broken is stunning. It was directed (brilliantly) by acclaimed British stage director Rufus Norris but it all begins with the book (brilliant) and the adaptation, brilliantly done by Irish playwright Mark O'Rowe. When I read the book, (horrified, tearful) I was concerned that the material might be too violent and simply prove too dark to work on film but O'Rowe's adaptation tweaks the source material, turning total devastation into something more bearable but equally profound. It begins when Bob Oswald (Rory Kinnear), a furious single father with anger control issues, brutally lays into Rick Buckley (Robert Emms), an awkward, simple neighborhood teen innocently washing his car because Oswald believes Rick has forced himself on one of his three daughters. He believes that because that's what his daughter tells him and this is a man who believes in and loves his daughters; despite the girls being the anti-creme de la creme. If there ever was peace in the neighborhood, that moment breaks it. That beating is the beat that starts it all, and it's only the first of several violent episodes that will change the lives of the residents of the cul de sac forever. 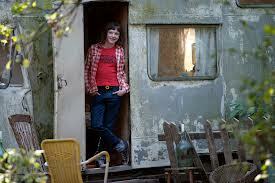 Eloise Laurence as Skunk with dad, Archie, played by Tim Roth. Such a lovely surprise to see the gentle side of Roth. I don't think I'll ever forget him from the opening coffee shop scene in Pulp Fiction. NOT gentle. While Norris' Broken shows Skunk's broken world populated with broken souls, he knows when to pull back from the bleakest moments and, taking a page from Daniel Clay, has even managed to blend warmth and comedy into the mix. Norris walks a fine balance, setting sweet moments between the riveting action; little pastiches of family life, where the characters just soar and sing; their voices, their actions are so sure, so authentic, so organic, that it all just seems effortless. The young actress who plays Skunk, the extraordinary Eloise Laurence, let's us see everything, not just on her face but in every gangly muscle in her body; sweet but not sappy as daddy's girl, splayed across actor Tim Roth's body at bedtime with familial ease; scrappy with her beast of a big brother (Bill Milner) slapping and teasing at each other like kids do; vulnerable as we see her crushing on her teacher, Mike Kiernan (Cillian Murphy) discovering the loveliness of a first kiss with a boy she likes (George Sargeant). The cinematography by Rob Hardy is lovely too; a masterful mix of dappled light and a slightly slowed action you expect from an indie coming of age film, but surprising and effective here in this hybrid. The score from Damon Albarn works in the same way; the music bounces along and we're lulled into enjoying the family dynamics, when, BAM, something horrible happens and Skunk's world breaks a bit more. There's so much more I'd like to say about this movie that I can't find words for; how poignant it was, how it makes you think about all the Broken things, not just in Skunk's world, but our world too. And it's unfair and quite, quite sad. But there's beauty in it too. Broken is currently in theaters and available to stream on Amazon. Read my Q+A with Daniel Clay, the author of the novel Broken. And watch the trailer below ... it's dazzling. I'm so eager to see this one. But you know, I've only heard of it in a couple of blogs, yours included, but I haven't seen the book or any promo on the film here in my city. Hope one day it will come. Also, I'll be heading to Toronto for TIFF. There are exciting films out there this year. I'll be watching for your updates from TIFF. Enjoy.